That means that Visual Studio could not find an appropriate license to validate the control. Generally, the license will be automatically included into the application and typically do not have to worry about licensing at all. The project must include a reference to the 'TX Text Control .NET for Windows Forms Component'. To include the reference, select Add Reference... from the Project main menu in Visual Studio. Browse for 'TX Text Control .NET for Windows Forms Component', select it and confirm by clicking OK. 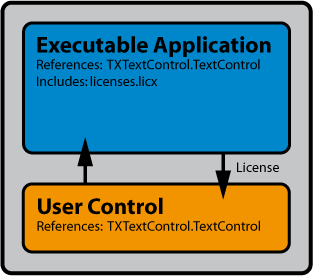 The 'licenses.licx' file is not a TX Text Control specific file, but a Visual Studio file that is used by 'lc.exe' (which is part of the .NET SDK) to compile the licenses into the assembly. These above steps are done automatically, if you drag and drop a TextControl from the toolbox onto a form. Load your Visual Studio .NET project. Open the Add Reference... dialog box in the Project... menu. Delete the reference to the current TX Text Control version. Add a reference to the new version and close the dialog box. Open the licenses.licx file of your project and change the version number of the referenced TX Text Control version to the version number of the newer TX Text Control version. Close the Visual Studio .NET development environment. Reopen the Visual Studio .NET development environment. Rebuild your project using the Rebuild Solution menu item.